Watch, but don't swim. Marina Beach is splendid for a breather, but don't even think of swimming. The undercurrents are so strong, it will be crazy to even attempt to dip your toe in. Go Indian. As in go for a traditional Indian beauty treatment. Threading is one exotic way of ridding unwanted hair. Then there's the hair treatments that India is renowned for. If you are up for it but don't want to go to a salon, call Dial-A-Beautician 91-44-28207612. Take a day off and do nothing but stay in your room and order room service!! It may seem wasteful, but you do need a lot of energy to be lazy! Take a taxi and drive around Chennai. Your driver will only be too happy to provide you with a running commentary. Get your hands and feet mehndi-d! This is really painting on your palms and feet using henna. It's really pretty as it's all flowers and leaves. The henna usually lasts for about 2 months before it fades away. Get yourself painted. 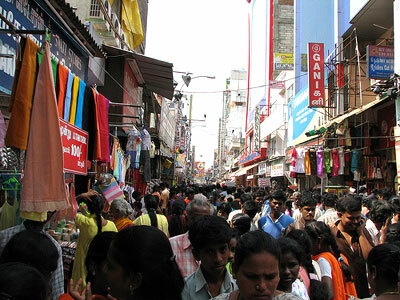 Shoppping in Chennai is a fun experience. It's colourful and chaotic, but you will find the shopowners friendly and wanting to please customers. It's modern and spacious, and has all the latest fashions. It's a one-stop place for all your shopping needs. Traditional crafts from the Tamil Nadu region can be found here. Here too, you are guaranteed genuine goods that are not knock-offs, and the prices are reasonable. If you are looking for sarees and textiles, come here! Here's another place to shop for sarees and cloth. It is one of the most beautiful and tidy complexes in Chennai. You will find garments, books, toys, multimedia/electronics, computers, music related items, greeting cards. And if you feeling hungry, you will find lots of places to eat there.